The Advanced People’s Democratic Alliance, APDA, has advised the Federal Government against releasing the last tranche of the Paris Club refund to state governors. 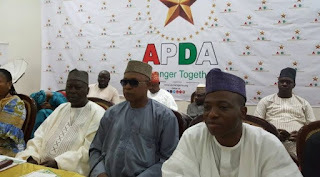 APDA said the continuous assistance to state governors by the Federal government of President Muhammadu Buhari is making them lazy and wasteful. In a statement by its Publicity Secretary, Tosin Adeyanju, on Wednesday, APDA said the Federal Government must ensure that state governments account for the previous money issued to them before release any more funds. The statement reads, “It is unfortunate and unacceptable that despite huge and timely release of these funds no state has been adjudged to have utilised the funds for its primary purpose. “To this end, APDA enjoins the Federal Government not to accede to any request for further release of funds until a comprehensive and extensive audit is carried out to determine the true state of affairs in the States especially in the face of the claims and counter claims of the state governments and labour unions.